This universal fit Car Seat Cover is Warm in Winter and Cool in summer. It measures 120 x 36 cms (47 x 14 inches) and suits all vehicles with removable headrests. The prices shown are for each seat cover. 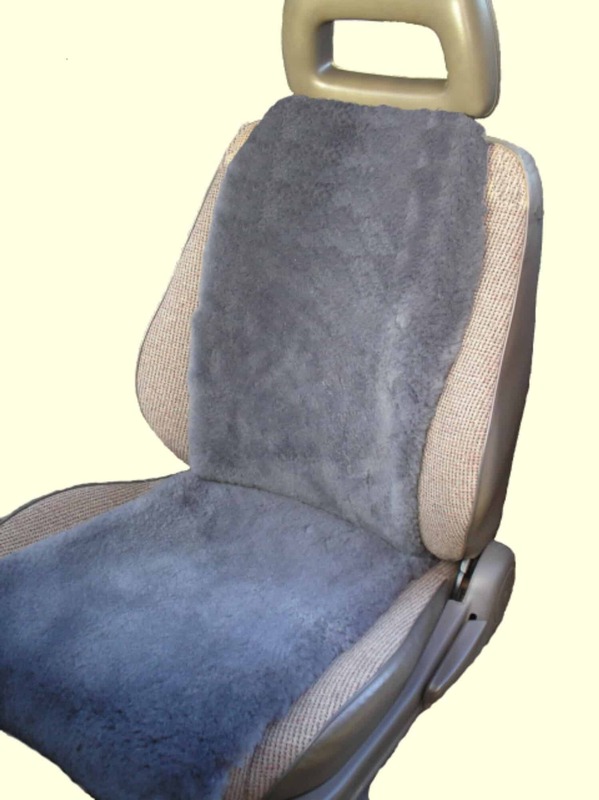 Good Wool Stores Insert Car Seat Covers are manufactured in Berry NSW from quality 25mm pile Australian Sheepskins. The covers are designed to blend into the central panel of your car seat giving Warmth in Winter and Coolness in Summer. The natural insulation qualities of wool make sheepskin the ideal medium to add to your comfort in all seasons. These panels are 120 x 36 cm and are fitted to seats with removable headrests. They are held in place with an adaptable secure tying system that ensures there is no hindrance to the deployment of Side Air Bags. All Good Wool Store sheepskin seat covers are fully washable, tough, resilient and long wearing. The listed price is for one seat cover. Sheepskin may be dry cleaned or hand washed in luke warm water with a recommended wool detergent. Dry in shade allowing air to circulate around the covers as much as possible. Orders are shipped from the store within 2-3 days of receipt of completed order including payment. This applies to goods held in stock and Custom Made Covers that appear on our tailor made listing. Within Australia we use Australia Post Prepaid Satchels. For larger parcels we use Australia Post or Courier Services of our choice. The Australia Post Satchels have tracking which we routinely record, but do not send to customers unless they are specifically requested. Internationally we use Air Mail services via Australia Post. There are a number of services with additional payments for faster services and tracking that depend on the country of delivery. Tailored products may take longer to produce if we do not have a pattern available. Our Motorcycle Listing is frequently updated, if you are unable to find your model, or have a request for other products please contact us. If we are unable to dispatch within 3 days we will notify you and seek advice regarding your willingness to wait or receive a full refund. Our aim is to have a happy customer using our products. Please contact us if you are not happy with the product as supplied. Fitting of seat covers can be difficult at times, and we are very happy to talk through their application before you return the items for refund or replacement. Returned item must be post marked within 14 days from initial receipt of item. Return postage is at your cost. We do not refund for change of mind, unwanted gifts, or ordering mistakes such as colour choice. Refunds will only be given as required by Australian Consumer Law in other circumstances such as major faults. We are proud to be able to make and sell quality sheepskin products. In the unlikely and very rare event that a defect escapes our quality control, we will repair, replace or refund within 12 months of purchase. Sheepskin is a natural product, some variations in colour and texture is expected and should not be regarded as a fault. Please contact us should you have any questions arising from the quality of our product.